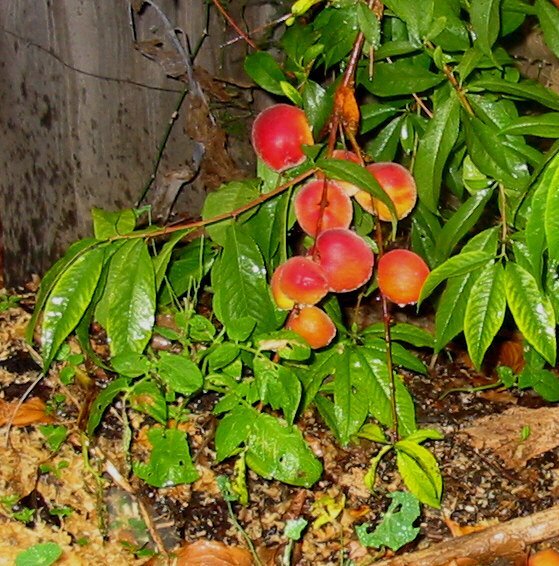 These peaches are ripening on a tree that sprouted at the edge of the compost pile about six years ago, and there it remains. I never got around to transplanting the tree. This little peach tree has been blossoming each spring for the past couple of years, and this year it finally set a few peaches. The tree seems to be perfectly happy right where it is even though it gets little direct sunshine, so maybe I will simply leave it where it sits. With an occasional pruning, and a bit of water now and then, it seems to be doing just fine, thank you. This entry was posted in Home and Garden and tagged compost, peaches. Bookmark the permalink.